Our fleet is back to one! We have sold our first aircraft (G-ATNL, pictured below) to Newcastle Aerodrome on the east cost of Ireland. We look forward to visiting them and seeing our old stalwart in action there. Our main aircraft is a Piper Cherokee. It's a PA28-180, which means it's got the large 180HP engine. This makes it suitable for four people in comfort, along with luggage, something that lots of smaller engined planes can't manage. It also has large tanks, making it suitable for long distance jaunts. When training, an interested observer can take a back seat, to help tune into the flying experience ready for their own. The aircraft is fully insured for club members to rent, (those above the age of 74 need to be put onto the insurance individually). Call us for full details of rental arrangements (e.g. check flight requirements etc. ), but the headline cost to club members is £145 per hour wet (i.e. 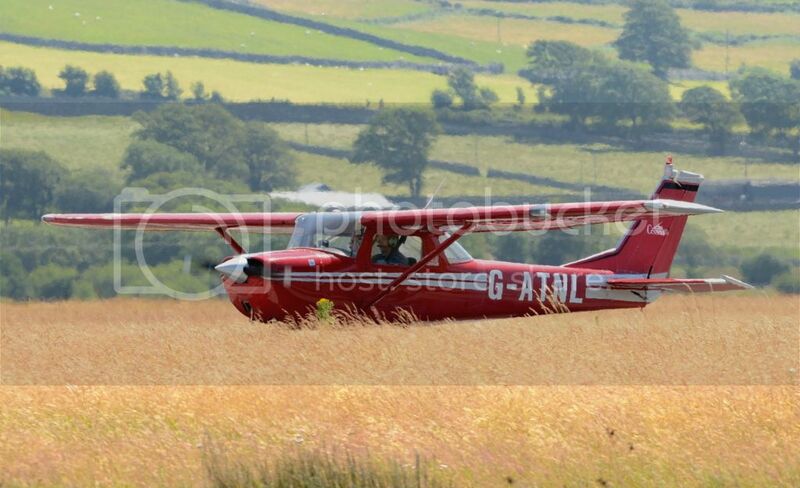 including fuel and oil), and landing fees at Llanbedr are included in any hire of 30 minutes or more. This rate has been extended until August 2016, and pre-paid bookings by that date will be honoured at that rate for a month after the rate changes. From 1st September 2016, a new rental policy will be in place, and existing private hire customers will be informed very soon. The aircraft pictured below was our first, and has now gone to ply its trade at Newcastle Airfield, on the coast, south of Dublin. Photo kindly provided by M Williams.